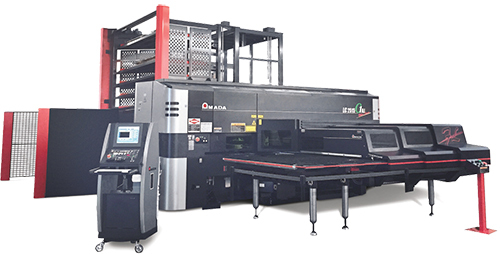 Amada’s new LC 2515 C1 AJ combines a 22-ton turret punch press, equipped with a 49-station multipurpose turret, and a 2-kW fiber laser. The laser head, which moves in the y axis via a direct-drive servomechanism, is isolated from punching vibration to help maintain beam integrity and ensure optimum cut quality. A gap near the laser axis allows cutting gas and slag to escape without impacting processing. And, a cartridge-type lens enables timely, quick lens changes. Other features include noncontact sensor technology to ensure that the laser beam remains focused on the sheet; three die-lift stations to facilitate upward forms and four tapping-tool stations in the turret; a barcode reader for quick program loading; and a variety of automated material-handling systems, including the ASR 3015N TK that extends unattended operation to multiple shifts and features single-part separation and sorting. 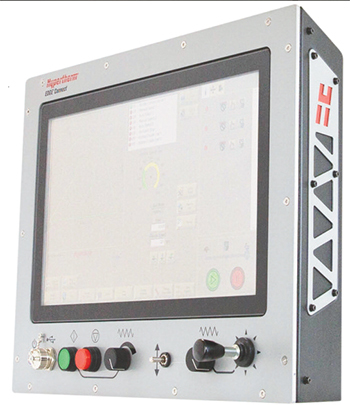 Hypertherm Inc. unveiled a new generation of computer numeric controls, the Edge Connect family, which combines new software technology with modern hardware in a compact package. Enhancements, aimed at optimizing efficiency of the firm’s laser-cutting machines (as well as its plasma- and waterjet-cutting machines), include the newest version of Hypertherm’s Phoenix software with the company’s CutPro Wizard for rapid and simple job setup. The family also includes an introductory version of ProNest CNC nesting software, which allows table operators to create a part program directly from the CNC. As Hypertherm officials explain, an operator could accommodate an urgent job using an available part file or quickly select a standard shape when the offline ProNest software programmer is not available. Hardware upgrades in Edge Connect include a large 19-in. touchscreen on Hypertherm’s full-featured unit, a quad-core processor, solid-state disk drive and EtherCat connectivity. On average, Edge Connect CNCs reportedly are more than 65 percent lighter and thinner, and use 70 percent less electricity than Hypertherm’s Edge Pro CNC line. 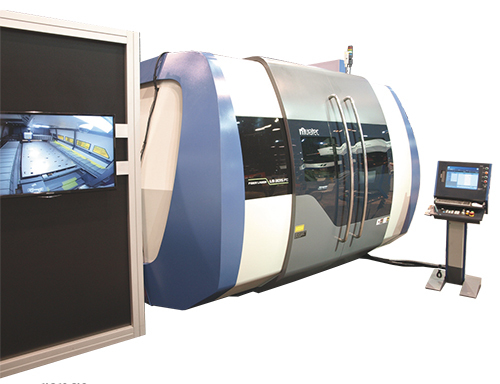 Customers can choose from three Edge Connect offerings, including a mini-CNC and a full-featured CNC. Also included in the line is the company’s SureCut technology that reportedly simplifies 2D and 3D cutting through the automatic inclusion of optimized process parameters in support of a range of applications. Mazak Optonics Corp. presented a number of innovations during FABTECH 2015. Courtesy of Mazak’s manufacturing campus in Florence, KY, comes the VCL (vertical compact laser) Tube 100, the first in a series of machines engineered and produced in North America to meet the specific demands of that market, according to company officials. 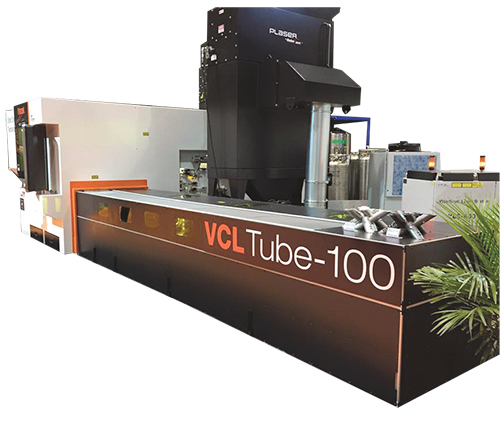 The prototype VCL Tube 100, displayed at the show to invite customer feedback prior to official product release in spring 2016, has been designed as a cost-effective solution for low-volume tube and bar components to 4-in. round dia. and 3-in. sq., in lengths to 25 ft. The VCL-series machines use solid-state direct-diode lasers and include a fiber delivery system. The VCL generator offers similar cut performance to fiber generators in mild and stainless steel, but, say company officials, direct-diode cuts aluminum more rapidly while increasing energy efficiency and offering greater modular flexibility than fiber generators. The VCL series is slated to expand, later in 2016, to include a coil-fed configuration and robot loading design for formed parts. 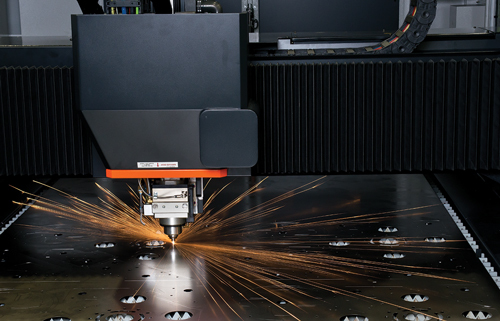 Mazak also unveiled a power boost with its OPTIPLEX Fiber II 6-kW laser-cutting system, designed for higher cutting speed in a variety of materials. The unit, available in 5 by 10-ft. and 6 by 12-ft. bed configurations, features the new Mazak Multi­Control torch as standard, with this automatic-setup technology replacing the need for short-, middle- and long-focus torches to cut a range of materials. To ease setup and operation, the OPTIPLEX 6kW system uses PreView control with a 15-in. touchscreen and straightforward user interface. The graphical interface visualizes the cutting path and automatically determines process conditions including the required lens, nozzle, feed rate and laser output for different materials and thicknesses. 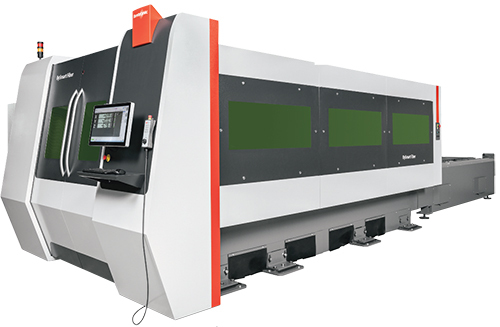 Bystronic touts its new BySmart Fiber 3015 compact fiber-laser cutting machine as ideal for first-time budget-minded users. The BySmart Fiber, equipped with a 2- or -3-kW laser, can process a wide range of materials and thicknesses, including mild and stainless steels, aluminum alloys and other nonferrous materials such as copper alloys and brass. Operators control the cutting process on the BySmart Fiber using a 22-in. touchscreen to drive the firm’s ByVision user interface. It directs the manufacturing process with just a few swipes of the finger. ByVision accesses a cutting-parameter database based on material type, creating the optimum cutting process that accounts for material thickness and part geometry. During cutting, ByVision monitors the process and provides critical data on-screen, providing an overview of the cutting plan, cutting-head position and machine status. 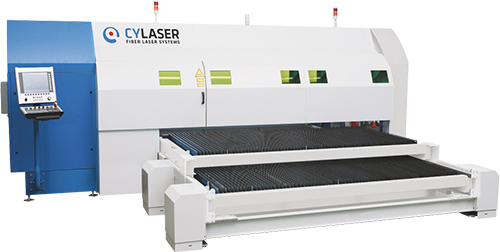 CY Laser America exhibited a unique side-loaded, compact fiber-laser plate-cutting machine, Model CY2D 4020S, designed, say company officials, for easy integration with material-handling automation. On the show floor was a machine fitted with a 72 by 144-in. dual worktable with integral hydraulic pallet changer, delivering a compact footprint (276 by 260 in.) when compared to the typical end-loading machine setups. The side-loaded configuration allows the table exit to be located on either the front or back of the machine as required to optimize material flow. Operators can access the table through sliding doors, eliminating the need to shuttle the table in and out for part inspection or other tasks. With a standard 4-kW generator, CY officials note that the machine will cut 1-in. mild steel, 5⁄8-in. stainless steel and aluminum, and 5⁄16-in. brass sheet. A 6-kW upgrade is an option. Lastly, all electromechanical components of the new model are available domestically, adding to long-term reliability and maximum uptime. 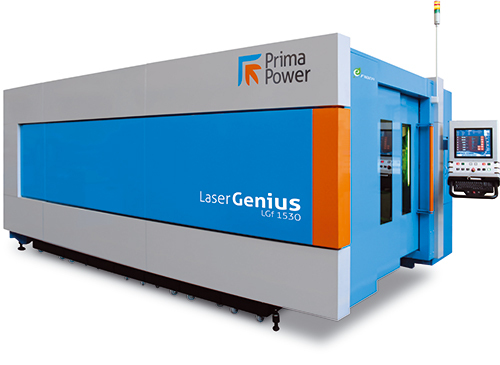 Prima’s new Laser Genius fiber-laser cutting machine features linear motors that it says allows increased productivity by as much as 15 percent compared to traditional systems. And, thanks to optimized piercing routines, fabricators can experience significantly improved cycle times. Three new pierce profiles specifically address three different applications—thin-sheet (to 5 mm) cutting, thick-sheet (5 to 25 mm in mild steel) cutting, and unattended or lights-out cutting. For piercing thin sheet, Prima offers the Smart Cut mode. Here, the laser head need not pause when transitioning between piercing and cutting. It’s one smooth process that can yield as much as a 30-percent cycle-time reduction compared to traditional piercing. For thicker sheet, fabricators will opt for the Max Cut pierce mode, featuring a hefty flow of nitrogen delivered to the workpiece material. This cooling effect reduces what can be a pierce time of 3-4 sec. down to less than 1 sec. And, for unattended cutting, Prima offers the Night Cut piercing mode, featuring a wide parameter window to ensure reliable and safe pierces. Trumpf debuted its 8-kW TruDisk laser, driving its TruLaser 5030 cutting machine, designed to significantly boost productivity when cutting medium to thick sheetmetal. The TruLaser 5030 fiber was shown equipped with Trumpf’s CoolLine, BrightLine and enhanced PierceLine functions, to support processing thicker materials. During cutting, the CoolLine nozzle directs a water mist around the laser beam as it reaches the workpiece. This reduces the heat transferred in the immediate cutting zone and achieves contours—small sidewalls and difficult geometries—that would otherwise be difficult or impossible to process. BrightLine nozzle technology accelerates the cutting gas to a high velocity and features special cutting data to allow fabricators to laser-cut stainless steel as thick as 0.8 in. And, the new PierceLine function regulates the piercing process to provide just the right amount of laser power for as short a time as needed, so that average power always stays just below the limit at which the material would burn off uncontrollably. The result, say company officials, is precisely pierced holes with a minimum amount of ejected material. Murata Machinery introduced its LS3015FC fiber-laser cutting machine, which allows users to select among three cutting modes: high quality, for the best possible cut; economy, which reduces gas consumption and operational costs; and high-speed, for the fastest production time. The machine features linear drives on all axes for precise, high-speed processing. A dual-pallet system preps new material and eliminates parts and scrap from falling onto the material during exchange. The Muratec MVHS proprietary control system adjusts to changes in the laser’s output within milliseconds. Included is a light-monitoring system that helps to prevent reflected light from damaging the laser, and continuous monitoring of processing parameters outside of the normal range. 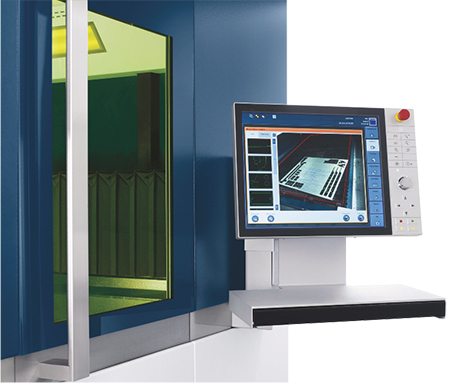 When detecting abnormal cutting parameters, the machine will stop processing to avoid damage or wasted material. See also: Amada North America, Inc, Bystronic Inc., CY-LASER America LLC, Hypertherm, Inc., Mazak Optonics Corporation, Muratec Murata Machinery USA, Inc., Prima Power North America, Inc., TRUMPF Inc.